We have just released a new universal iOS app for iPhone, iPad, and iPod touch called Baby Monitor for IP Camera for your Axis cameras (App Store link). Baby Monitor is created by parents for parents to keep an eye on our babies using IP cameras. This is a free app with in-app purchases. - Securely monitor your baby from anywhere with your iPhone, iPad. - Protect video and audio access with your own username and password. - Get alarm notifications when the baby cries or there is a loud sound in the room. - Monitor in background, e.g. browse the Internet, check emails or skim photos. The baby will be monitored. - If you were away and the application is running in background, see if any alarms were missed. - Check audio level and alarm history on a graph. - Intelligent Audio analysis helps to eliminate false alarms by distinguishing baby cry from background noise. - Talk to your baby using "push-to-talk" feature (2-way audio). - Take unlimited snapshots and save them in your photo library. - Record video with audio. - Use audio sensitivity parameter to fit your individual environment by adjusting app sensitivity to occasional noise. - Set squelch level to eliminate unwanted static noise. - Personalize video background with a pic of your baby from the photo gallery. - Search your network for easy setup. - Control your camera remotely. - Use pinch/zoom gestures for digital zoom. - Use infrared night vision to let you see without disturbing baby?s sleep. - Additional camera controls like focus, iris, relay. - Use night mode to reduce energy consumption. - Chromecast support (Google Cast Ready). Currently the app supports almost all Axis cameras using RTSP/MPEG-4/H.264 with 2-way audio (ptz, preset, relay, focus, iris, LED). Please select G.711 μ-Law or G.726 audio codec on Axis camera before using the app. It also works with some other camera brands as well. We are going to make the best app available on the market for baby monitoring. Please feel free to send us any suggestions and bug reports. Your feedback is extremely important for us. Когда Ваше приложение будет поддерживать 2-way audio как в tinyCam Monitor для Android, а также RTSP/H.264? Это планируется? When your application will support 2-way audio, as in the application tinyCam Monitor for Android, as well as RTSP/H.264? All these features is in high priority TODO list. Hope till the end of this year these features will be implemented in Baby Monitor for IP Camera. RTSP/H.264 support for tinyCam Monitor is in process. I'm working on that. New version of Baby Monitor for IP Camera for iOS is available on iTunes. - Improved baby safety - alarm is activated if connection to the camera is lost for more than a minute. - (New) Great collection of alarm sounds to choose from. - (New) Personalize video background with a [ic of your baby from the photo gallery. - Night mode is automatically switches off when the device is moved. - Fixed G.711 codec for Axis camera. We are constantly improving our app and many of our changes come directly from users. Keep the feedback coming and thanks again for taking the time to let us know what’s important to you! New Baby Monitor for IP Camera (iOS) 1.6 released. Now this is the only app in Apple AppStore which allows making video recording from IP camera with audio. - Video & audio* recording with Advanced Feature Pack in-app purchase. It will be automatically given for free to everyone who already purchased Multiple Camera Support. Note: the purchase of audio option is required to record audio. - Fixed the bug that disabled alarm clock sound when the app was running. - Fixed 15 sec. audio delay with some Axis camera configurations. - Stability and audio reliability improvements. - 2-w audio for Axis cameras. - Zoom in/out by double tap on image. Selection of active camera using swipes. This Application is great! it's good for mommies to monitor their baby..
Great App! I have one question. I purchased the audio pack. I can listen, but how do speak? I'm using the M1034-W which has 2-way audio. Thanks in advance! Just swipe to the right to get Mic button. Hold it and talk. 2-w audio should work for Axis. 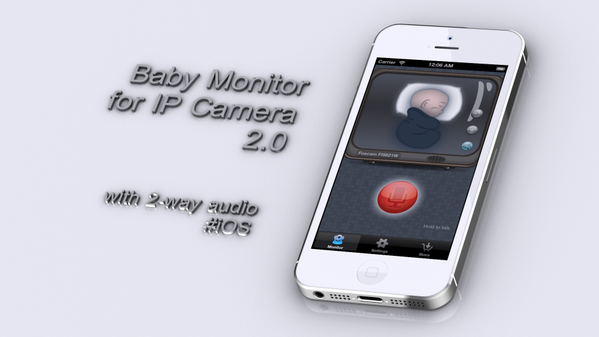 Baby Monitor for IP Camera 3.0 is available to download from Apple AppStore. This is the biggest update we have ever made for Baby Monitor for IP Camera with a lot of new features. Please enjoy! - Multiple cameras support. Simultaneous monitoring of up to 6 cameras on iPhone and 8 cameras on iPad. - Streaming video to Chromecast device (Google Cast Ready). Audio support will be added soon. App should be active to get Chromecast working. No background operation possible on iOS. - Redesigned UI for iOS 7 and iOS 8. - New RTSP/H.264 engine for smooth playback of video from Axis cameras. - Improved MPEG-4/H.264 decoder speed, especially for 64-bit CPUs (iPhone 5S, iPad Air, iPad Mini 2). - Many bug fixes and stability improvements.